We don’t consider ourselves to be on vacation, but we had a wonderful two weeks of vacation in Aruba–it’s too hot to call it anything else. Here’s my advice based on our visit. We rented a house in Savaneta that was quirky but worked well for us. 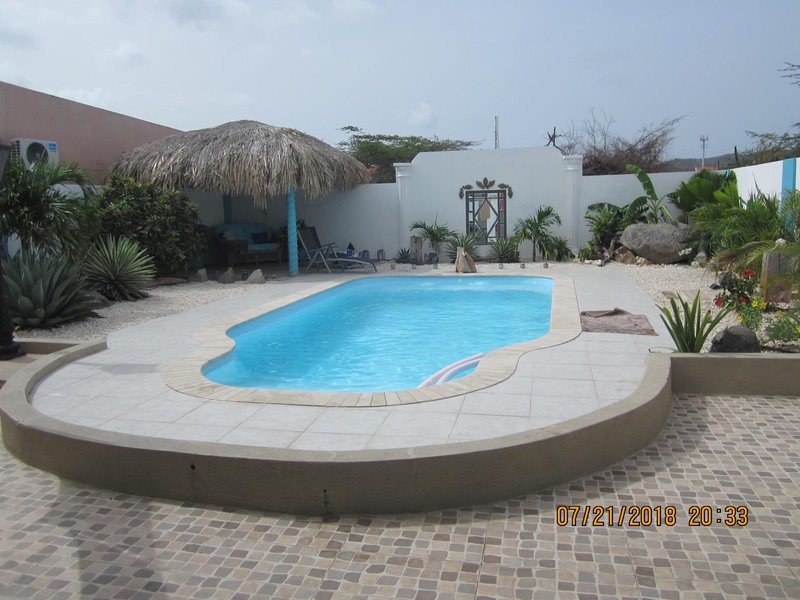 I didn’t think a pool was very important since we were so close to the ocean in Aruba, but I had no idea how hot and humid it is just sitting still. A pool lets you sit around outside for a while reading or writing or whatever you enjoy and when you feel really hot you can take a dip and feel refreshed without a hike to the beach or drive in a hot car. We swam at least twice a day. The covered patio and pool were a highlight, especially since there were shaded spaces at either end of the pool so you could be in the shade morning or evening. There were colored lights you could turn on at night..and a tiki bar….Jonathan did almost all our cooking on the grill in the tiki bar/kitchen on the patio. Air conditioning is the essential ingredient for a happy stay in Aruba, “One Happy Island”, and ours worked well. Only one bath had hot water though that was rarely an issue. If you have delicate skin you might consider another destination for your vacation. We all got as much sun in two weeks in Aruba as we might in an entire summer in the US. Most activities involve being outdoors or in the ocean, with breaks to jump in the pool. The temperature is at least 80°F all day and night. After a week we all felt like human potato chips. Between the salt and the sun, your skin dries out completely. Liberal application of sunscreen and lip balm can ward off burns and blisters, but it’s really impossible to avoid the sun entirely. On the other hand, why would you visit Aruba and plan to stay out of the sun? Driving our rental car was no problem in Aruba, it’s just like the US. Roads are narrow and not always in good repair. Rental cars need to stay on reasonable surfaces, they are too low for the really bumpy unpaved roads. 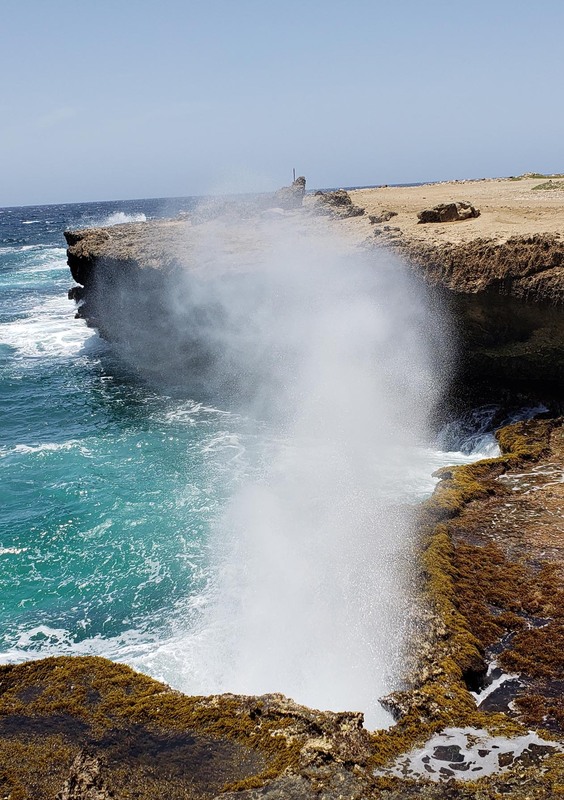 If you are going to be in Aruba for a week or more you might consider renting a jeep or other high-centered vehicle for a day or two to explore the Arikok National Park and the north/east coast of the island. There are wonderful small beaches and inlets to visit. 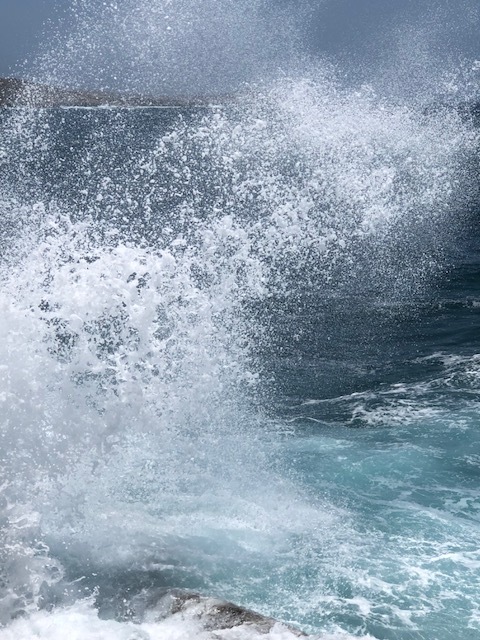 The mighty power of the crashing waves is remarkable. We were able to visit much of the area, but barely made it over some of the rough spots in our rental car even with two experienced off-roaders in charge. Aruba has its own currency, the Aruba Florin (AFL). Change a $20 but don’t bother getting more. You’ll only use it for the occasional soft drink. Local people do all their shopping in florins, but prices aimed at foreigners (restaurants, supermarket, gift shops, even the flea market) are almost always in dollars—vendors don’t seem to want florins and often charge double the dollar price in florins. That is, a $10 item costs 20 florins. The problem is that a florin is worth about $ .75, meaning that you just paid $15 for a $10 item by using the local currency. Not worth it. Aruba is united by the local language, Papiamento. All local people speak it among themselves and it’s a quick guide to who is local and who is not. If you can understand someone, they’re tourists, or working with tourists. People from Aruba are Dutch citizens and school children learn Papiamento, Dutch and English. Many people also speak Spanish, especially if their family came to the island from Colombia or Venezuela. It’s pretty impressive to find your average person speaks at least three languages. People working with tourists often speak five or six. Be careful what you say! There is a lot of publicity about shopping in Aruba, but it’s shopping for items imported from other places. This part of the Dutch Caribbean is a desert island. Its industry is tourism–there isn’t much that is made in Aruba itself. There’s some local white rum, including Palmera, there’s locally brewed Balashi beer, some aloe products, and a very few local crafts. Everything else is made elsewhere, stamped Aruba and brought in by the container-load. There are no markets like there are in Central and South America because there are no local food products. We found fresh fish but it took some effort. There’s only fresh fish when someone goes out fishing and fishermen don’t go out every day. Some of the best known fish restaurants serve frozen imported fish and shrimp most of the time. Aruba has no natural surface water, and all water comes from an impressively large desalination plant that serves the entire island. Everyone drinks the tap water and it is very pure. We drank the water and put ice in our drinks from our first day and had no stomach troubles. It saves a lot of plastic bottles.